Carrie Underwood’s engagement ring is massive! 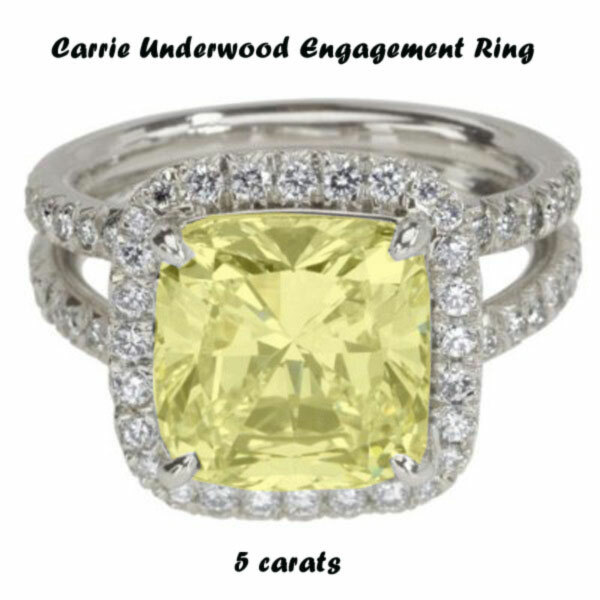 Carrie Underwood’s new engagement ring from her finance, Mike Fisher, could blind most anybody. It is estimated at around $150,000 and said to to be a 5-plus carat round flawless yellow diamond with diamond sidestones. It was designed for her by jeweler Johnathon Arndt. Take a look at a ring that looks like the Carrie Underwood 5 carat engagement ring. Carrie Underwood and Mike Fisher are engaged as most people know? The story allegedly surfaced after a friend of Fisher’s had something about it on his Twitter page. So anyone who was following that guy got to read, “Congratulations to Mike Fisher and Carrie Underwood! We just got the call at our family Christmas get-together.” The Ottawa newspapers got a hold of that news and ran with it. Then the next day Underwood’s publicist confirmed the couple’s engagement. Wanted to write about this one since the wedding rings chosen were so beautiful to me. You see, Kevin Jonas & Danielle Deleasa Jonas have exchanged vows at their extravagent ceremony this past Saturday at the Oheka Castle in Long Island. Despite a blizzard blanketing the roads around the castle, the wedding went forward without a hitch, and the bride, escorted by her father Thomas “Bucky” Deleasa, walked down the aisle to “Bella Notte,” from Lady and the Tramp, played on the guitar by a friend of the Jonas family. Now comes all the fine details about the custom built Jacob & Co. wedding rings. According to a release from the jeweler, Danielle’s wedding band was constructed out of 18 carat white gold. 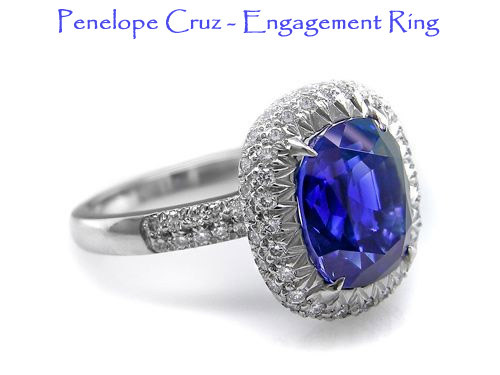 The stones you see flanking the entire ring are round-cut brilliant diamonds totaling 3.83 carats. Married Couple on So You Think You Can Dance – AMAZING!! So You Think You Can Dance married couple Ashleigh and Ryan Di Lello brought the judges to tears in last night’s last show. They weren’t the only ones. My husband said it was beautiful but could not uderstand why I was pulling the kleenex out like cash from an ATM. I answered, “You can see how much they love each other…booohoooo…booohooo…..” Well anyway, it was an awesome show and I have included the highlight of their tryouts on YouTube below. Chelsea Clinton announces engagement by e-mail? Update – July 31st, 2010 – Check out the pictures from Chelsea Clinton’s wedding here. Couldn’t she have just updated her facebook status to “Engaged” and got the media circus going crazy just for fun? I am pleased that Chelsea is respecting the Clinton’s wishes of “Don’t get married before you’re 30” edict. She’s 29 now, but with a February birthday she’ll hit the magic number in plenty of time for the summer wedding. Clinton spokesman Matt McKenna said he believed the engagement happened “before Thanksgiving.” Others close to Clinton also indicated the engagement happened earlier and was only announced Friday. Penelope Cruz engaged and getting married? Penelope Cruz wore a big sapphire and diamond rock on her ring finger to the New York Film Festival premiere of ‘Broken Embraces.’ Was it an engagement ring? She wouldn’t say. She seems to be engaged to Javier Bardem. Penelope Cruz is reportedly shopping around for a designer to make her wedding gown. According to In Touch Weekly, the 35-year-old actress, who is reportedly engaged to actor Javier Bardem, has been meeting with her favorite designers in preparation for the couple’s rumored wedding. “Since she and Javier are from Spain, she’d love to have a Spanish designer create her dream gown,” a friend mentioned. Cruz is said to be considering the House of Balenciaga, who designed best friend Salma Hayek’s gown for her wedding with billionaire François-Henri Pinault in February. 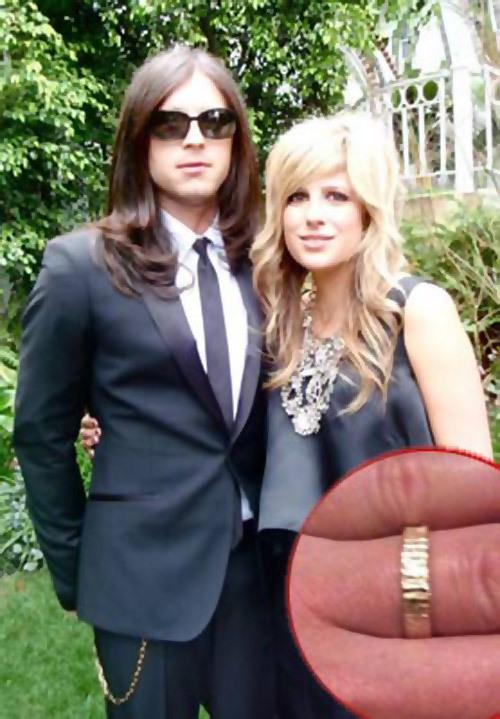 After dating fellow musician Jessie Baylin for over three years, Kings of Leon drummer, Nathan Followill has finally tied the know to the woman of his dreams. The pair married in an outdoor ceremony on Saturday, November 14 at Wolf Den Farm in Brentwood, Tenn. (located at 9795 Split Log Road), followed by a night of barn-dancing. Guests enjoyed food catered for by local Nashville restaurant Miel, while the couple’s first dance was to an instrumental Hawaiian lap steel guitar tune.